Microsoft Teams has come to the University of Portland campus. 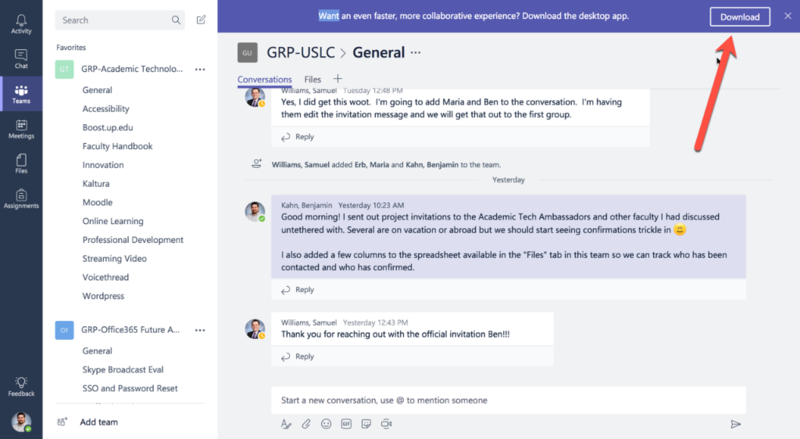 Teams is similar to the mega-popular work-based chat app Slack, in that it provides a new way to collaborate and communicate via an interactive chat-based workspace, and that can conveniently integrate with other powerful productivity tools. The idea is to provide 21st-century knowledge workers with a flexible and fun way to stay in sync while cutting down on email overload and never-ending meetings. While this new breed of chat app caught on first in the offices of cool start-ups in San Francisco and New York, it’s being popularized in many fields as all types of workers become more mobile and more collaborative – including higher education. Colleagues who need to work in close cooperation across departments and disciplines, students who participate in clubs and projects, and even teachers and learners in an academic course can all use Teams to enhance collaboration and engagement. My colleagues in ATSI and I had been using Slack for quite some time and recently switched to Teams. In this brief guide, I want to share some tips and best practices for those who are new to this novel way to communicate professionally. You can login to teams.microsoft.com to use Teams on the web, but for the best experience download the Teams app to your PC or Mac. Running an app version means you don’t need to remember to log in and check Teams for new messages or put your password in every time you want to use Teams. If you’re on the go, there are Teams apps for your iPhone or Android phone too. You should be prompted to download the desktop apps when you log in to the Teams web experience. You’ll also find download links by clicking on your profile picture from within Teams. 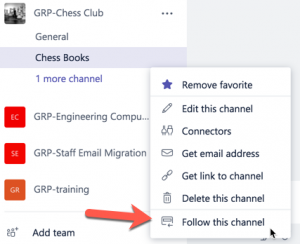 The basic structure of your Team will consist of “Channels,” which are essentially spaces dedicated to discussing a topic or for a subset of members. When a Team is created, it comes with a single channel called “General.” The General channel is a great space for all-purpose communication, IE “I have a doctor’s appointment and will be in later this morning” or “Happy Friday, everybody!” What other channels you create to organize communication is up to you; you can organize by project, department, or whatever criteria makes sense for you. Put some thought into this before you start creating channels, but feel free to experiment. You can always delete channels or add additional channels later. As chat-based alternative to email, Teams adopts an “opt-in” philosophy when it comes to notifications. It’s clear that the makers of Teams don’t want chat to become a new source of distraction to you when you are trying to focus on other work. So, out of the box, Teams will only send notifications when someone on your Team “@mentions” you or replies directly to a comment you added. That said, it’s easy to opt-in to notifications for the conversations that are important to you. The first step is to “Favorite” channels you want to stay on top of by clicking the star icon next to the channel name. Favorited channels will be“stickied” to the top of your list, and channels with new comments will appear in bold. You will also get notifications if someone else @mentions a favorited channel by name. As an example, say my Chess Club Team has a new channel called “Chess Books” where members can review or recommend reading. I can click the star to keep the books channel in my list and see the channel name in bold when I have unread messages. If you want to go a step further, you can “Follow” channels by clicking the ellipses next to the channel name and choosing the Follow option. When you follow channels, you will get notifications for any new activity on the channel. If you want to keep up with all the conversations and messages in a channel, favorite and follow that channel so that you can be notified and respond to messages in real-time. I primarily use Teams with a small cohort and many channels, so I have favorited all channels and followed the ones I want to stay up-to-the-minute with. Your situation might be different. Either way, understanding how to make notifications work for you is key. Teams is available for anyone at UP to try. If you’d like more information, feel free to send me an email at kahn@up.edu. Ready to dive a bit deeper? Check out my interactive presentation Teams Top Tips. We all depend on our networks for support. As humans we love to communicate, to share our experiences, to learn from others, and to influence and be influenced within our social spheres. This is equally as true for professional networks where we can talk shop with peers as it is for networks of family and friends – especially for those in the business of teaching and learning. In 2016, more and more networking of all kinds is happening online. One of the best tools to develop a personal learning network, or PLN, is Twitter. Chances are, you use Facebook to keep up with distant relatives or old friends and classmates. Expanding your PLN by connecting with other educators around the world on Twitter can be just as rewarding. Maybe you want to bounce a teaching idea off of a diverse, international audience or connect with other peers in your field right here in Portland. Or, perhaps you just want to to passively keep up with what the most prominent academics in your field are doing (using Twitter just to read others tweets without ever tweeting yourself, or “lurking” is a perfectly fine use of the platform). The “P” in PLN is because it is personalized to work best for you. There are lots of resources out for teachers getting started with Twitter – like this easy reading primer on microblogging with Twitter. The article has some great ideas you can try out if you are new to Twitter to see if it’s for you. I’ve pulled out and expanded on a few you can try today! Search Twitter (http://search.twitter.com/) for keywords that are meaningful to your research, teaching, or job. Make sure to use a hashtag; IE #nursing or #arthistory. Twitter will also suggest popular hashtags to you based on your search terms. You’ll be surprised how much lively conversation you’ll find! Sign up for an account (https://twitter.com/signup). Try to chose a short username. Add a few details about yourself and follow a 5-10 people. Twitter will suggest people for you to follow, or you can search for people. Encourage students to follow a professional working in a field related to their studies, e.g. a photojournalist, an entrepreneur, or a web designer. This is a great way for students to gain some insight into the career they are interested in. You can even embed a Twitter feed directly into Moodle. The next time you attend a conference, keep an eye out for a Twitter hashtag that is being used to organize discussions around the conference on Twitter. This is a fantastic way to network and communicate while at a conference. If there’s a conference you can’t attend, you can still find out and use the hashtag to network remotely – it’s often listed on the conference website. Ready to put yourself out there? Write a few posts about what you’re doing, reading or writing, reply to someone else’s Tweet, or just “retweet” a Tweet you like. Excited to grow your PLN but confused on how to actually navigate Twitter? This 3 minute and 30 second video breaks down how to search, tweet, retweet, and “favorite” tweets. Up Tech Tips is a series of handy technology related hints, tips and tricks written especially for University of Portland faculty who are engaging with technology in the classroom or in hybrid and online classes. 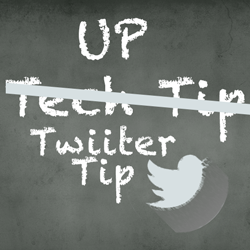 Tips are written and/or curated by Ben Kahn, Academic Technology Specialist and Trainer at the University.